Every acid has a characteristic dissociation constant (Ka), which is a measure of its ability to donate hydrogen ions in solution. In other words, Ka provides a way to gauge the strength of an acid. 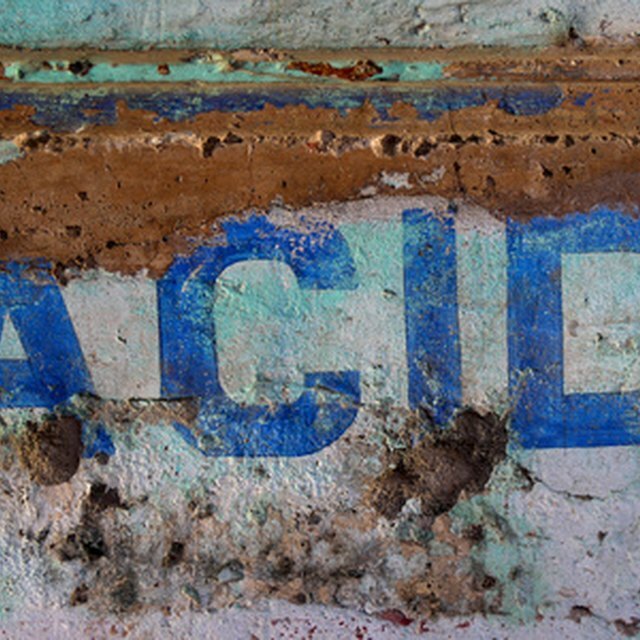 Larger values signify stronger acids. The pH (power of hydrogen) of a solution is a measure of the concentration of hydrogen ions and is also a measure of acidity, but it isn't the same as Ka. There's a relationship between the two, though, and you can calculate Ka for an acid if you know the concentration of acid and the pH of the solution. HA + H20 <--> H30+ + A-, where A- is the conjugate base. All the reactions happen in water, so it it's usually deleted from the equation. It you know the molar concentration of an acid solution and can measure its pH, the above equivalence allows you to calculate the relative concentration of acid to conjugate base and derive the dissociation constant Ka. To do this, it helps to set up a table that delineates the Initial concentrations of reactants and products, the Change in concentrations and the concentrations at Equilibrium. This is an ICE table. Rather than setting one up in a general way, it's more instructive to illustrate the procedure with a specific example. Acetic acid, the acid that gives vinegar its sour taste, is a weak acid that dissociates into acetate and hydronium ions in solution. The dissociation constant Ka is [H3O+] [CH3CO2-] / [CH3CO2)H]. As noted above, [H3O+] = 10-pH. Since x = [H3O+] and you know the pH of the solution, you can write x = 10-2.4. It is now possible to find a numerical value for Ka. Ka = (10-2.4)2 /(0.9 - 10-2.4) = 1.8 x 10-5. Deziel, Chris. "How to Calculate Ka From Ph." Sciencing, https://sciencing.com/how-to-calculate-ka-from-ph-13710445.html. 23 March 2018.